The word Rumalil/Roomal means a handkerchief. 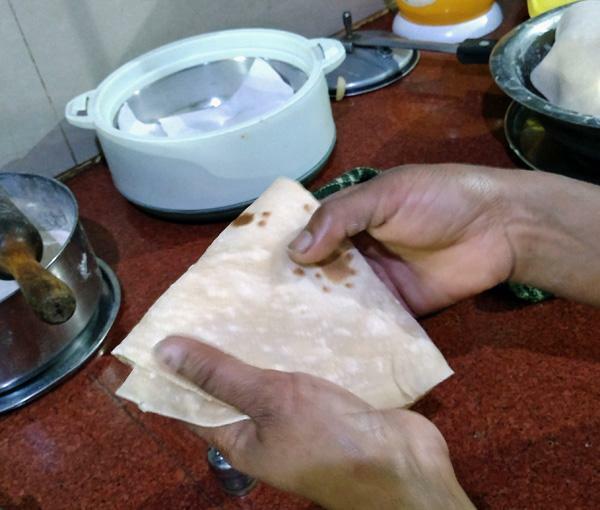 This this Indian roti is thin like a handkerchief, hence the name Roomali which means 'like a roomal’. It is served folded like a handkerchief. It is usually served with meat curries of different types, because it is good for soaking up/scooping up gravies. However, it is equally great with vegetarian dishes Follow the steps, looking carefully at the pictures. 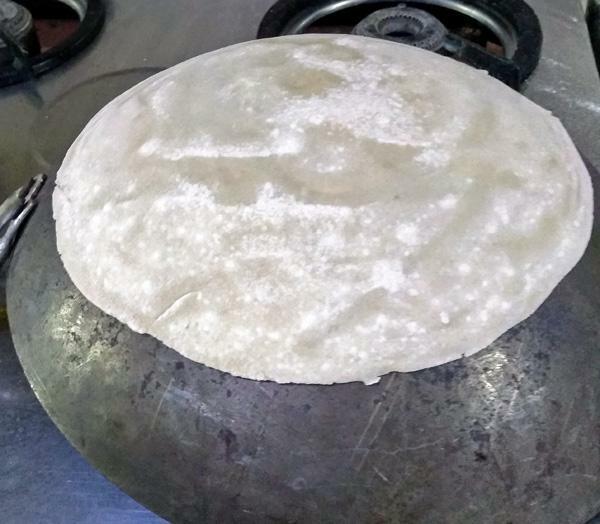 it is an unleavened bread, rolled out very thin and cooked on an upturned Karahi or a heavy bottomed wok. Chefs usually throw it in the air, just like a pizza, but that is a learnt skill, mostly out of an average cooks skill range. Here it has been mostly rolled out and then briefly thrown in the air. 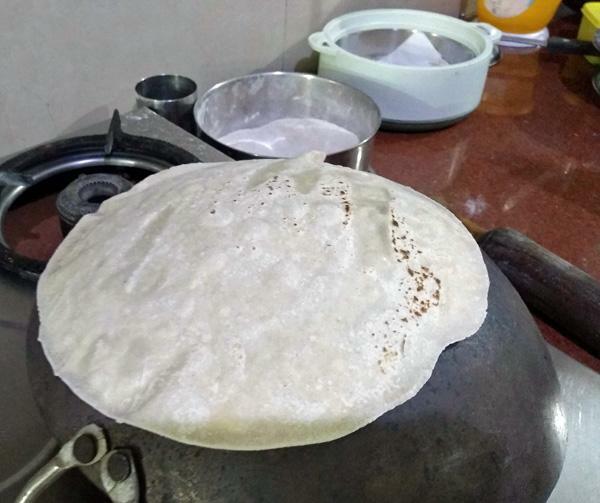 This roti can be cooked on an electric hob too. 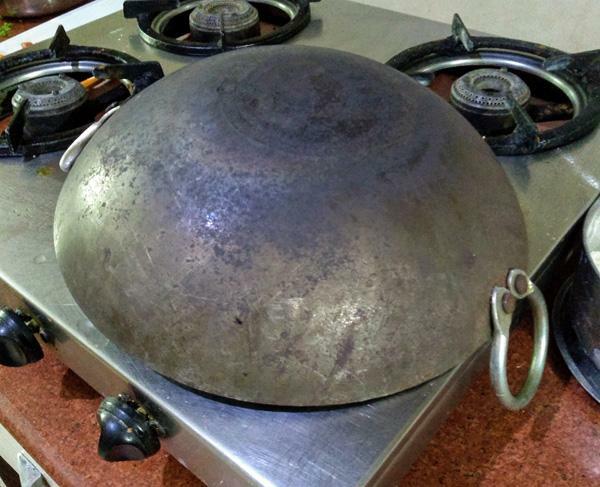 A thick/heavy bottomed karahibor wok. Mix both flours, oil and salt in a bowl. Add water slowly and knead to make a medium soft dough. More experienced you are, softer dough you can work with. Cover and keep aside for 1/2 to 1 hour. Place karahi or a griddle upside down on the stove to preheat it. 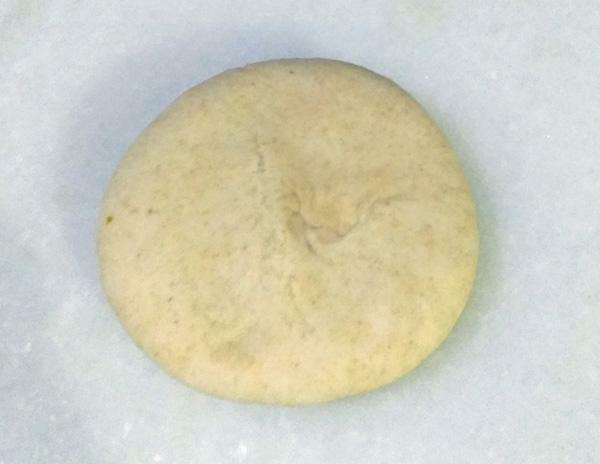 Take a golf ball sized portion of dough and roll it into a smooth ball. 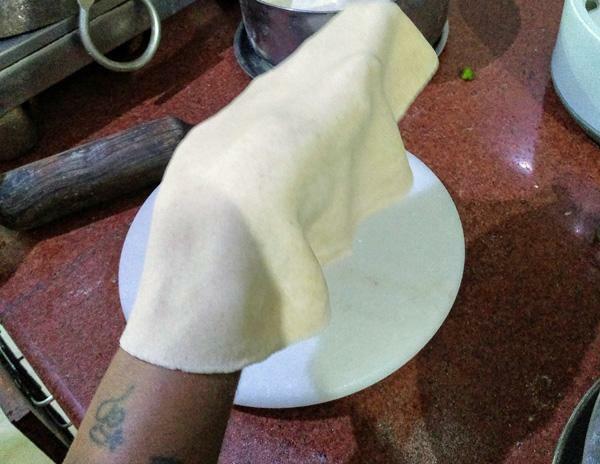 Roll out the roti, dusting it in the dry flour from time to time. This will need a fair amount of practice. Do not worry if they are not a perfect circle initially. It takes practice. 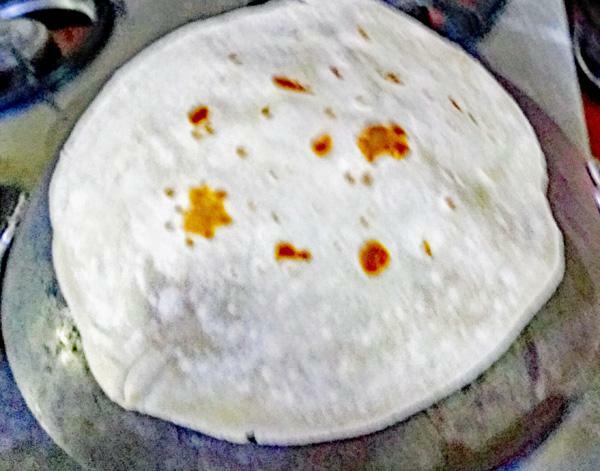 It i easier for people who are accustomed to make chapatties. 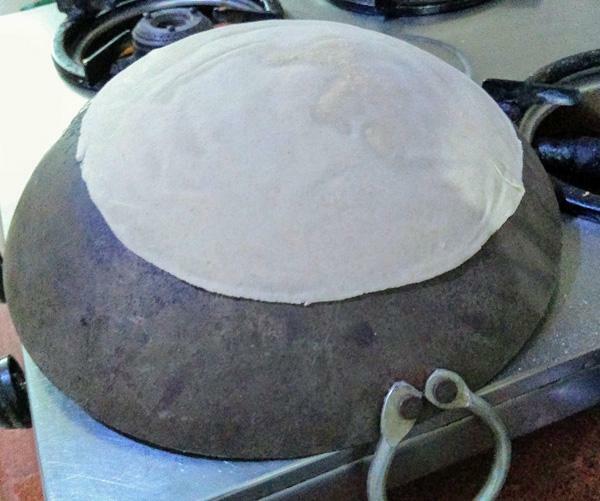 The roti should be thin enough to be nearly translucent. 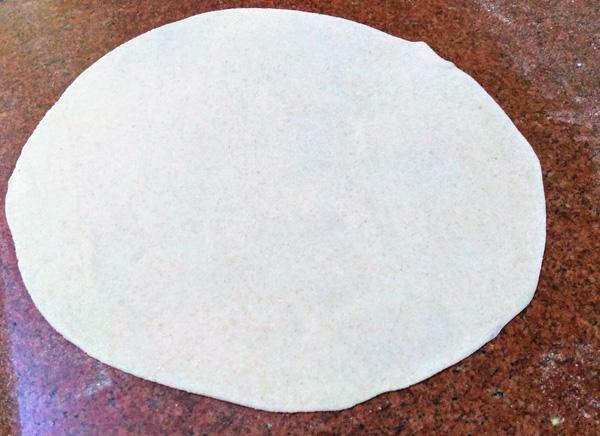 Once rolled, pick it up gently, roll it around on your fingertips, see picture. Place it gently on a preheated wok, keeping it on high. After 10-15 seconds, several small bubbles will start appearing. Turn it over. Cook until the this side has several brown dlisters. Take it off the griddle. Fold it into quarters and serve hot. If making in advance, place in a thermal container to keep them warm. These roties should be eaten fresh.